Marfa Contemporary is a regional extension of the Oklahoma Contemporary Arts Center. It is a charitable organization committed to encouraging creative representation in all its forms through exhibitions and education. Art presentations by regional, national and international artists at Marfa Contemporary will be free to viewers year-round. The organizers of the venue also offer classes and workshops for children and adults at minimal cost. Marfa Contemporary is currently showcasing the art of Laurie Frick, an artist who draws from neuroscience to create complexly hand-built works and installations to study the nature of pattern and the mind. She attained a Master of Fine Arts from New York Studio School and a Master of Business Administration from the University of Southern California. She also attended an executive program at Harvard and London Business School as well as an Interactive Telecommunications Program at New York University Tisch School. She studies self-tracking and human patterns using her background in engineering and high-technology. She has been showcasing her art in her solo exhibitions in Texas, Oklahoma, Los Angeles, and New York. Furthermore, she collaborated with various curators such as Kaegan Sparks, Colin Raymond, Kyle Kramer, Shona MacDonald, Debbie Hesse, Carol Padberg, Virginia Rutledge and Maya Joseph-Goteiner. Her awards include Swing Space Studio award by Lower Manhattan Cultural Cultural Council and Outstanding artist of the year for 2012. She was also awarded residencies by the Neuroscience Research Center University of Texas, the Yaddo, Headlands and the Bemis Center. Her publications and reviews include Austin Statesman, The Huffington Post, New Scientist, Los Angeles Times and NPR Arts Eclectic. 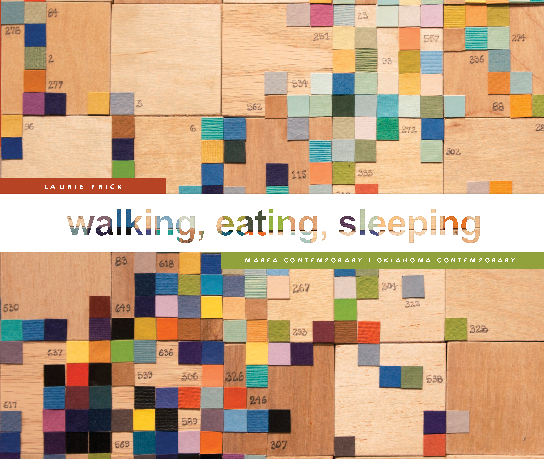 Laurie Frick’s Walking, Eating, Sleeping Show Catalog will be shown at Marfa Contemporary until January 13, 2014. An artist talk was conducted on October 13, 2013. It has been recently held at Oklahoma Contemporary last June and August of 2013. Now, it is time for the people of Marfa to appreciate the art of Laurie Frick. In this art exhibit, Laurie Frick considered numbers as abstract concepts. However, many recognize pattern instinctively. She is experimenting with wall-sized patterns that anticipate the condition of a person’s daily-selves. This entry was posted in Luxury Travel, Marfa, Marfa Texas, Travel, TX and tagged Cibolo Creek Ranch, Cibolo Creek Ranch Luxury Resort, Clark Coolidge, Crowley Theater Annex, Marfa Book Company, Marfa Contemporary, Marfa Lecture, Marfa Reading, Marfa Texas, Sleeping Show Catalog, Sunset at Chinati, Texas, Texas Luxury Resort, Travel, Visiting the Land of Enchantment. Bookmark the permalink.